The Pulse gives you a graphic interpretation on how much time you work on your projects. Even if you only have one project that you’re working on, the Pulse can still provide you with useful information on your work patterns. Here's how to use your Pulse and develop a "sixth sense" about your work rhythm. Start by going to the 'Pulse' tab in the green control panel on the left hand side of your screen. Here you'll see a bird's eye view of what you've been working on! 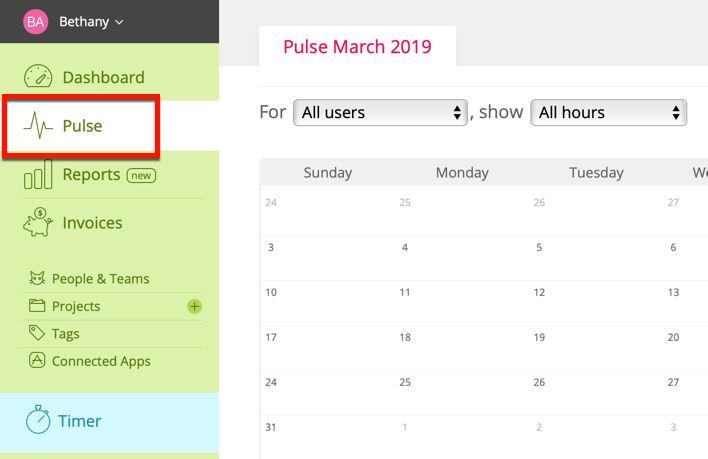 The Pulse you see is always for the current month, but you can switch between months by using the 'previous month' and 'next month'buttons in the upper right corner. By default you'll see "all users" (except if you have a Solo/Freelancer Account) and "all hours" in your Pulse. You can set filters for active and archived team members, billable hours, and unbillable hours. 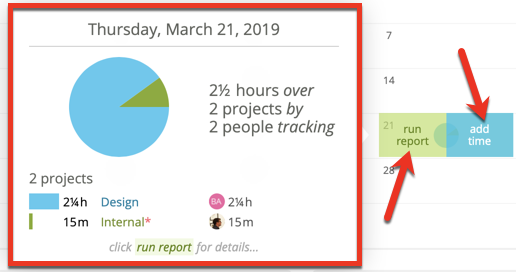 Hovering over any of the pie charts will give you the total amount of time you’ve worked that day, as well as how many hours were spent on which project. If you work on a team, you'll also see the total amount of time your team members have worked that day, as well as how many hours they spent on each project. Click on the green 'run report' button to go directly to a report for the day. There you can view a full break down of your workday. Or click on the blue 'add time' button to focus the Quick Entry Box and add any missing time for that day. The information on the Pulse page allows you to analyze your work behavior, lets you easily recognize patterns in your work flow and gives you enough information to optimize your work days. Each box below the calendar shows you a different breakdown of your time. The "Hours" box shows you the total hours for the month and the breakdown of hours per team member. 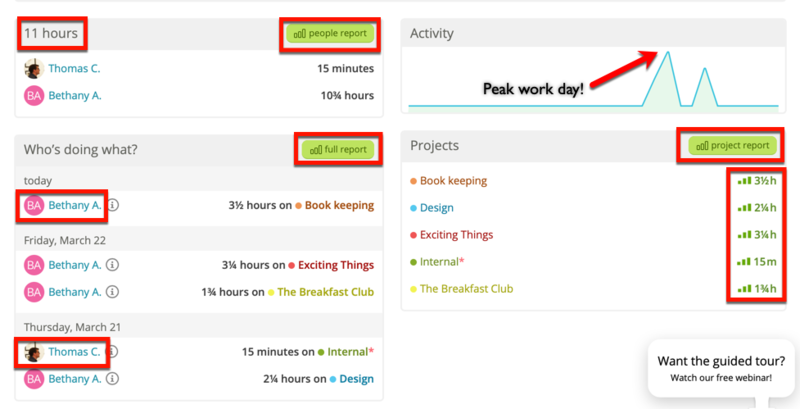 The "Activity" box displays the progression of your work habits throughout the month. You can use the "Activity" box to see what days are your most productive work days. The "Who's doing what?" box provides a breakdown of each of the days according to how different team members spent their time that day. Finally, the "Projects" box shows you what active and archived projects were worked on and how many hours were spent on each project. You can create quick, pre-filtered reports that focus on specific pieces of your data by clicking the green report buttons.